Lock tumblers are small, metal posts that fit inside individual linear holes within the barrel of a pin tumbler lock. The color, length and arrangement of these tumblers correspond inversely to the peaks and valleys on the key: short posts match the peaks, long posts match the valleys. The order of the tumblers is crucial; if even one post is out of place, the key will collide with that tumbler and thus be unable to turn, rendering the lock useless. Pin tumbler locks are the most common type of keyed lock. Remove the two long screws holding the lock in place, using a Phillips-head screwdriver. The key plate (keyhole) and turning face (knob) of the lock will separate. Remove both pieces from the door and set the turning face aside. 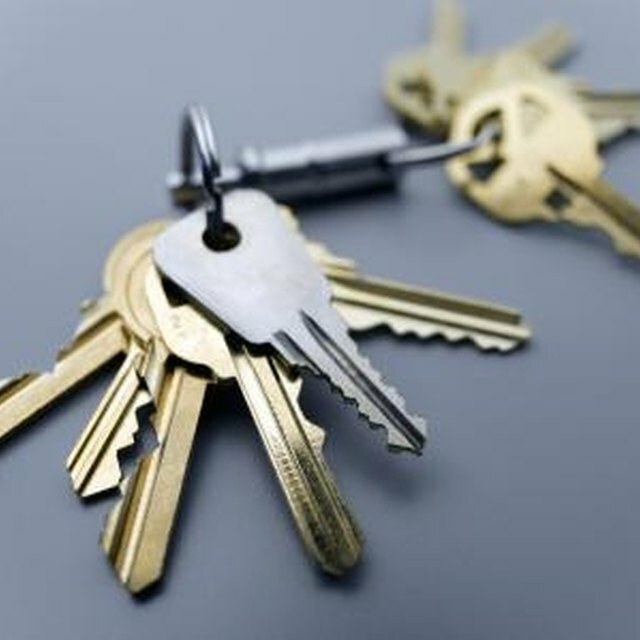 Hold the key plate firmly in your hand, and separate the lock cylinder from it by pushing the cylinder inward until it is free of the key plate collar. Set the key plate collar into a small container. Insert the correct key into the keyhole/cylinder plug and pull the cylinder away from the cylinder plug. Place the cylinder in the container. Position the cylinder plug so that the keyhole is facing away from you. On the back rim of the keyhole is a steel retainer ring that wraps downward around the cylinder and connects to a rectangular tumbler cover. Locate the small tab on this retainer ring that rests on the rectangular tumbler cover. Place your thumb over the tumbler cover to prevent the tumbler springs from ejecting the posts when it is removed. Gently pry the clip tab up and away from the cylinder with the flat-head screwdriver. Take care not to damage or distort the retainer ring. Place the ring in the container. Hold the cylinder plug steadily and slowly lift the tumbler cover from the top of the lock cylinder. Set the tumbler cover aside. Beneath the cover are five small holes with colored posts inside; these are the lock tumblers. Record the exact order of the colors of the posts, starting from the post hole nearest the keyhole, on a notepad. The colors correspond to the particular length of each post. All brands of locks use different color codes; as a result, it is impossible to know the size of the posts without measuring them. Position the upright cylinder so that it is directly above the small container into which the other lock parts have been placed. Turn the cylinder over and empty out the tumblers and springs. If the order of the tumblers is not recorded, it is possible to test the lock by placing all springs and posts back into the cylinder plug and inserting the key. The order is correct when all tumblers rise to the same level within their post holes and the key rotates freely within the cylinder plug. If a key breaks off in a lock, removing the tumblers will free up the portion of the key still inserted in the lock. Pin tumbler kits are available at hardware stores and can be used to rekey any standard door lock or replace lost tumblers. Never empty out a lock cylinder without first recording the order of the tumblers. Kenneth Schroeder is a Texas-based writer with more than 18 years of writing experience. He has worked for EssayWriters.net as a writer/researcher/editor since 2005, has been published in poetry journals and has had humorous works published at Cracked.com, YankeePotRoast.org, and CollegeHumor.com. He will return to Texas State University in the Fall of 2011 to pursue a degree in computer science.